Speaking, listening and writing activity to practise present simple, daily routines and telling the time. Click the image to download the worksheet. 1. Divide the class into groups of three and distribute photocopies of a table. 2. 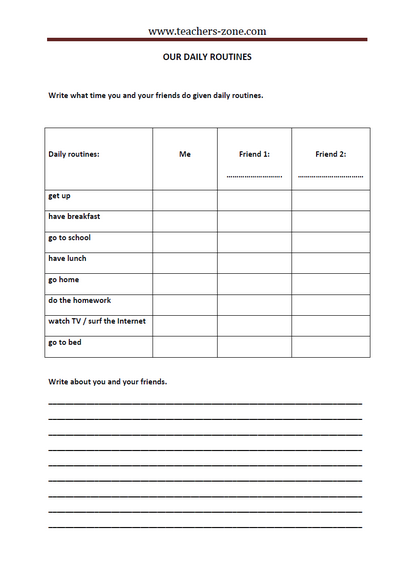 Ask students to write down what time they do each daily routine. 3. Each member of the group tell about his/her day and the rest note the times in the table. 4. After speaking activity or as homework your students write description using information from the table. For example: I get up at six o’clock, but Matt and Kate get up at half past six. I have breakfast at half past six and Matt has breakfast at seven o’clock. Kate doesn’t have breakfast. etc.